You got it, here's what every guy wants to eat all the time: meat and potatoes. I designed this salad at Mixt Greens to win over men and get them to start eating salad. Putting these ingredients together almost forces them to try it — it's one of the bestsellers at the restaurants and has been for more than three years. Preheat the oven to 375 degrees. Preheat the grill to high. Roast the potatoes: In a bowl, toss the potatoes with the extra-virgin olive oil, rosemary, thyme, and salt and pepper. Place on a baking sheet and roast for about 20 minutes, or until golden brown. Make the dressing: Combine the vinegar, mustard, garlic, shallot, thyme, and sugar in a blender. Slowly add the canola oil in a stream and blend to emulsify. Season with salt and pepper and set aside. Caramelize the onions: Heat the 1 tablespoon canola oil in a sauté pan over medium heat. Sauté the onions for 10 to 12 minutes, until the natural sugars caramelize. Make the steaks: Season the steaks with salt and pepper. Turn the grill to medium-high. Grill the steaks for about 7 minutes per side, until medium-rare. Remove the steaks from the grill and let them rest for about 3 minutes before slicing into 1-inch cubes. 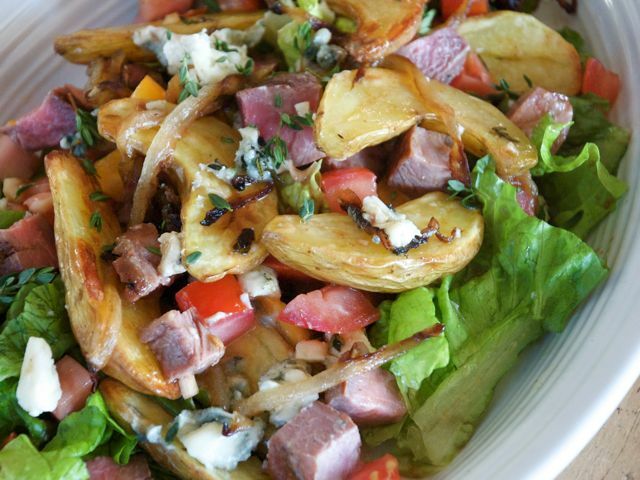 Plate each serving: Toss 3 ounces red-leaf lettuce, slices from half a tomato, 2 tablespoons blue cheese, ½ cup potatoes, and 3 tablespoons onions with 2 tablespoons of the dressing. Season with salt and pepper and top with the cubes of steak.